snowy's tatting: Catching up, running late. Masquerade by Mary Konior just needs the ends sewn in, I think it has a lovely look to it, done here in Tatilicious' Grackle Mess, size ? 40, I can't remember, sorry. 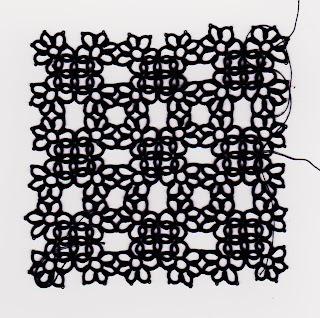 This pattern has had me squealing with frustration! 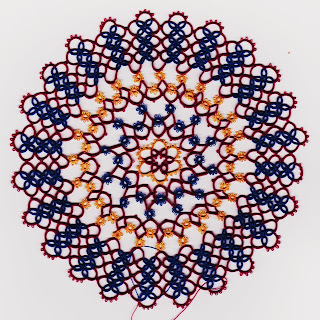 It is from a German book called "Viktorianisches Occhi" and is the beginning of a doily. 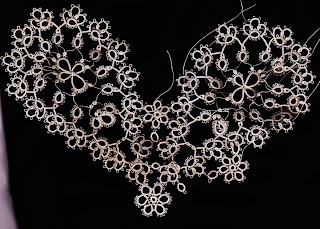 I am using some DMC 100 lace thread which my son bought me as a present. 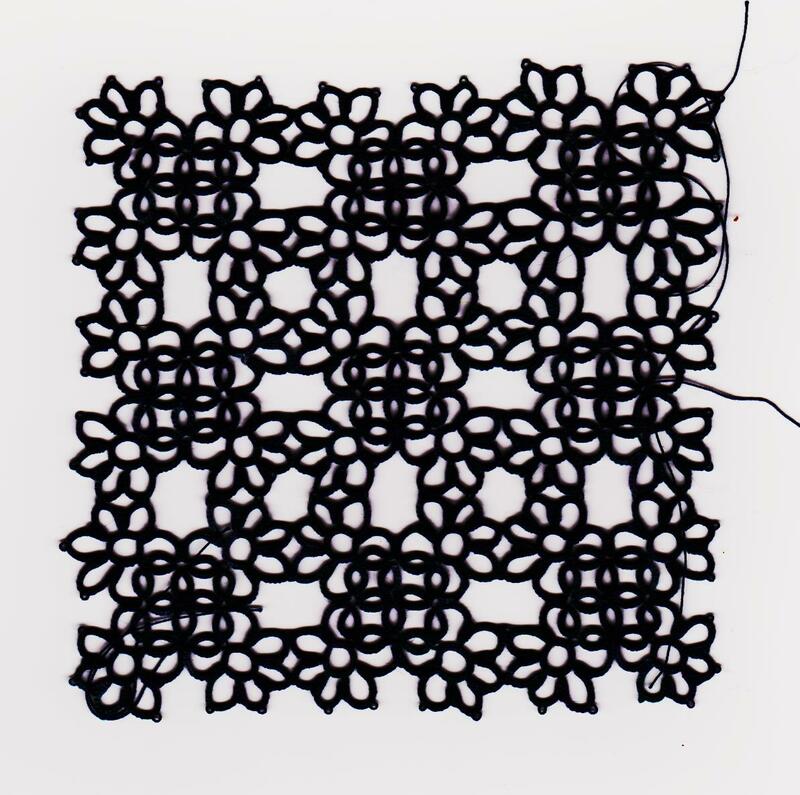 Well the pattern is all made up of separate motifs and bare threads, it flips and flops in every direction, and it gets very grubby very fast. There are six petals, SIX! not to mention all the little stars in between. This is not soothing to tat. I know, decorating tatting shuttles is soo 2010! However, I decided to try it, following this page. Mine were something of a disaster, with rough edges and bumpy surfaces. Luckily I chose shuttles that were not my favourites, the one that now has shells on was already broken and mended, so I don't feel I have lost anything. I may try again...perhaps I can work out from my mistakes what to do another time. Suggestions welcome! 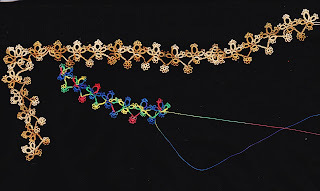 To finish I have been working on these edgings, the pattern is "Iris" by Frivole, and the golden thread is some of the Valdani, kindly donated by Fox, while the other is a Gütermann machine thread. I am having a little difficulty going round the corner...and it would be helped by a press with the iron, but the iron and the ironing board have been put away in case of visitors...so I am not going to do it now. 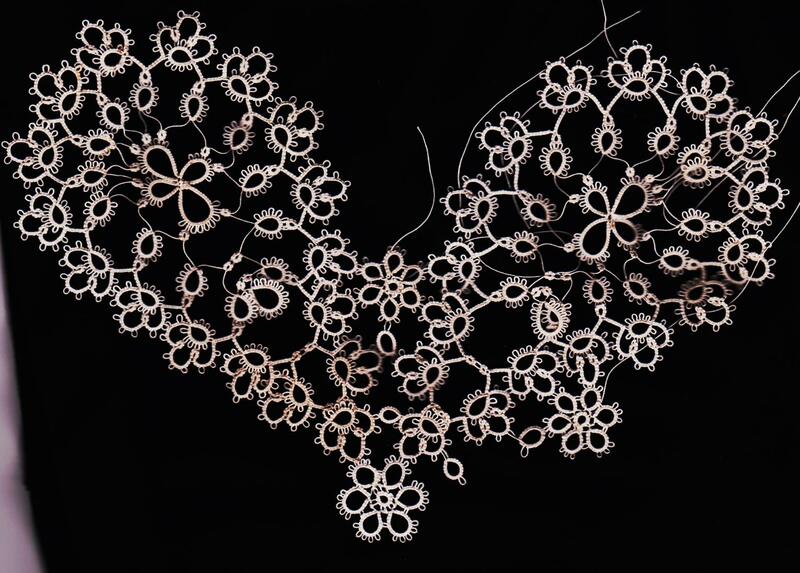 Such beautiful tatting, even though you don't sound very happy about any of it! 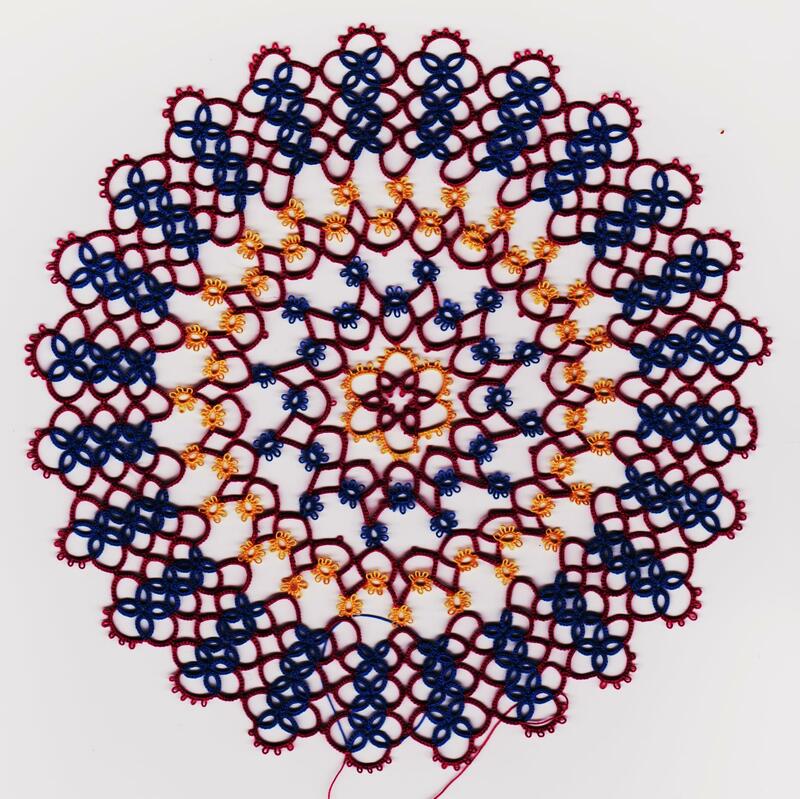 Renulek's doily is on my to-do list. I like the colours you've chosen to do it in. Snowy, the Renulek looks amazing! And I am impressed with what you have tatted with the Valdani. You didn’t say if you liked working with it or not?? ?